I received the plant from a friend who had no clue how to grow them. She was slowly killing all her plants and gave them to me to save them. When I got them, this plant was about 6-8 inches tall. 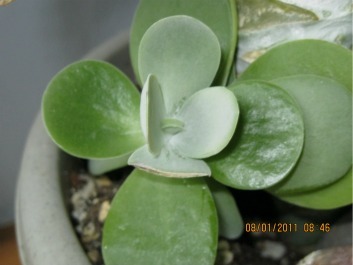 The picture of the bottom of the plant is what I received from her. 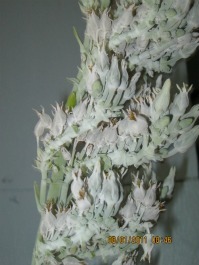 There were no flowers and the leaves had a white powder on them as well as on the stem. I have had the plant about a year and this is how tall it grew...51 inches. It grew so fast that I did not have time to put a stake in it and it now needs a support of other plants, a wall, or something to prevent it from falling over. There are three new clumps of growth at the base. I have not done anything special with them other than water and sunlight. We have a southeast window that it sits by and gets all late afternoon sun. I water it once every 1-2 weeks, sometimes a little longer if I forget. I have never given it any special soil or fertilizer. When I got it from my friend about a year ago, I transplanted it into a bigger pot. It grew in the first six months an sprouted the flowers on top which did blossom pink I believe. I have no idea if I can cut any of it, shape it a little better, or if I need to transplant it again. Do I cut the whole top off where the dead flowers are or do I leave them, or do I cut right after the dead blossom of each stem? I'm not even sure what type of plant this is and she did not know either. Cynthia, whatever you're doing is exactly right, with the exception of the pruning - most succulents don't mind being pruned at all, so I would go ahead and cut off the top part, the old flower stalks and even down to where the new sprouts are coming out. This will make it much bushier and easier to handle, and as each new sprout gets bigger, continue to prune or pinch those back to prevent this overgrown long gangly effort that it will do without this treatment. 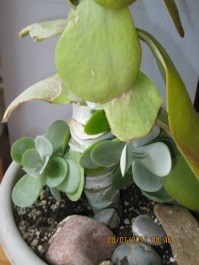 See more on pruning succulent plants here. I'm pretty sure that this is a type of Kalanchoe, either thyrsiflora or similar species, but I'd have to do more research to pin that down. If it is one of these, it's also known as 'flapjacks' for the two leaves that stand pretty much upright in the younger growth, just like a couple of pancakes. 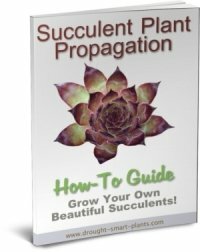 See more on succulent care on this page. Good luck with your plant - your friend must be proud of you!